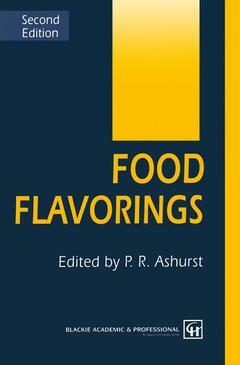 Food flavorings -(2nd ed' 94) Ashurst P. R.
Auteur : Ashurst P. R.
The need for a further edition of a book is gratifying for contributors and editor alike. When faced with the corresponding challenge to identify what has changed in one sector of a particular industry, however, initial enthusiasm frequently declines. Nowhere is this more evident than in this book on food flavourings, because the industry still remains the tantalising blend of art, science and technology that was alluded to in the first edition. Instrumentation and analytical skills can now identify flavour components down to nanogram and picogram concentrations and yet the skilled flavourist is often still able to defeat this scientific ability. Many parts of the food industry, and in particular the more traditional outlets such as baking and confectionery, use flavours and methods of application that have changed little in fifty years. At the other end of the spectrum, advanced synthetic chemistry methods and computer-controlled natural product processes can give the flavour industry a greater selection of higher quality materials than ever before. The industry itself has, in recent years, undergone many commercial changes, and in the U.K. some manufacturers' names known for a century or more have disappeared to become part of larger corporate entities. Flavours are for the first time controlled, albeit in a small way, by statute based on a European Directive. 1 The control of quality in the manufacture of flavourings.- 1.1 Introduction.- 1.2 Preamble to the System of Quality.- 1.3 Organisation to Achieve BS 5750 Accreditation.- 1.3.1 Commitment is Mandatory.- 1.3.2 The Driver.- 1.3.3 Management Project Team.- 1.3.4 Dedicated Word Processor.- 1.3.5 Quality Manager.- 1.3.6 Communication.- 1.4 BS 5750 Specification, Production and Installation.- 1.4.1 Introduction.- 1.4.2 Quality System Requirements.- 1.5 The Detail.- 1.5.1 Departmental Manuals.- 1.5.2 Management Responsibility.- 1.5.3 Responsibility and Authority.- 1.5.4 The Policy Manual.- 1.5.5 Quality System.- 1.5.6 Contract Review.- 1.5.7 Document Control.- 1.5.8 Purchasing.- 1.5.9 Purchaser-Supplied Product.- 1.5.10 Product Identification and Traceability.- 1.5.11 Process Control.- 1.5.12 Inspection and Testing.- 1.5.13 Inspection, Measuring and Test Equipment.- 1.5.14 Inspection and Test Status.- 1.5.15 Control of Non-Conforming Products.- 1.5.15 Corrective Action.- 1.5.16 Handling, Storage, Packing and Delivery.- 1.5.17 Quality Records.- 1.5.18 Internal Quality Audits.- 1.5.19 Training.- 1.6 The Assessment.- 1.6.1 Outline.- 1.6.2 The Pre-assessment.- 1.7 Conclusion.- Note.- 2 Essential oils.- 2.1 Introduction.- 2.2 The Production of Essential Oils.- 2.2.1 Steam Distillation.- 2.2.2 Water Distillation.- 2.2.3 Dry Distillation Methods.- 2.2.4 Expression of Oils.- 2.2.5 Extraction.- 2.3 Further Processing of Essential Oils.- 2.3.1 Rectification.- 2.3.2 Washed Oils.- 2.3.3 Oil Quality.- 2.4 The Uses of Essential Oils.- 2.5 The Composition of Essential Oils.- 2.5.1 Bitter Almond Oil.- 2.5.2 Bergamot Oil.- 2.5.3 Buchu Leaf Oil.- 2.5.4 Cassia Oil.- 2.5.5 Cinnamon Oil.- 2.5.6 Clove Oil.- 2.5.7 Coriander Oil.- 2.5.8 Cornmint Oil.- 2.5.9 Cumin Seed Oil.- 2.5.10 Davana Oil.- 2.5.11 Dill Oil.- 2.5.12 Eucalyptus Oil.- 2.5.13 Garlic Oil.- 2.5.14 Ginger Oil.- 2.5.15 Grapefruit Oil.- 2.5.16 Jasmin Concrete and Absolute.- 2.5.17 Lemongrass Oil.- 2.5.18 Lemon Oil.- 2.5.19 Lime Oil.- 2.5.20 Litsea Cubeba Oil.- 2.5.21 Nutmeg Oil.- 2.5.22 Peppermint Oil.- 2.5.23 Rose Oil.- 2.5.24 Rosemary Oil.- 2.5.25 Spearmint Oil.- 2.5.26 Star Anise Oil.- 2.5.27 Sweet Orange Oil.- 2.5.28 Tangerine Oil.- 2.5.29 Thyme Oil.- 3 Oleoresins, tinctures and extracts.- 3.1 Introduction.- 3.1.1 General Comments.- 3.1.2 Costs.- 3.1.3 Raw Materials and Processes.- 3.2 Plant Materials.- 3.2.1 Origin.- 3.2.2 Crop to Crop Variations.- 3.2.3 Storage.- 3.2.4 Yield.- 3.2.5 Degradation.- 3.2.6 Preparation of Plant Material.- 3.2.7 Vanilla Bean Curing (Classical Method).- 3.3 Solvents.- 3.3.1 Polarity.- 3.3.2 Boiling Point.- 3.3.3 Viscosity.- 3.3.4 Latent Heat of Evaporation.- 3.3.5 Temperature/Pressure.- 3.4 Tinctures.- 3.4.1 Water Infusions.- 3.4.2 Alcoholic Tinctures.- 3.5 Oleoresins.- 3.5.1 Solvents.- 3.5.2 Solubility.- 3.5.3 Commercial Solvent Extraction System.- 3.6 Absolutes 77 3.6.1 Solvents.- 3.7 Extraction with Carbon Dioxide as a Solvent.- 3.7.1 Introduction.- 3.7.2 Subcritical C02.- 3.7.3 SupercriticalC02.- 3.8 Summary.- 4 Fruit juices.- 4.1 Introduction.- 4.2 Fruit processing.- 4.2.1 GeneralConsiderations.- 4.2.2 Soft Fruit Processing.- 4.3 Specialised Fruit Processing.- 4.3.1 Citrus.- 4.3.2 Comminuted Citrus Bases.- 4.3.3 Pineapple Juice.- 4.3.4 Processes Requiring Heat.- 4.4 Products and Packaging.- 4.4.1 Frozen Juices.- 4.4.2 Aseptic Packaging.- 4.4.3 Self-Preserved Juice.- 4.4.4 Preserved Juice.- 4.4.5 Hot Pack Products.- 4.5 Product Specifications.- 4.5.1 Soluble Solids Content.- 4.5.2 Titratable Acidity.- 4.5.3 Brix/Acid Ratio.- 4.5.4 Other Specifications.- 4.5.5 Juice Adulteration.- 4.5.6 Specifications for Essence/Volatiles/Citrus Oils.- 4.6 Volatile Components of Fruit Juices.- 4.6.1 Production.- 4.6.2 Composition of Fruit Juice Volatile Fractions.- 4.7 The Use of Fruit Juices in Flavourings.- 4.7.1 Fruit Juice Compounds.- 4.7.2 Flavourings.- 4.8 Summary.- 5 Synthetic ingredients of food flavourings.- 5.1 General Aspects.- 5.1.1 Introduction, Definitions and Documentation.- 5.1.2 Flavour Generation.- 5.1.3 Flavour Analysis.- 5.1.4 Flavour Manufacture.- 5.5.5 Composition and Formulation.- 5.2 Synthetic Flavour Ingredients.- 5.2.1 Classification.- 5.2.2 The Flavour Wheel.- 5.2.3 The Different Flavour Notes.- 5.3 Synthetic Flavour Ingredients and the Future.- 6 Beverages flavourings and their applications.- 6.1 Introduction.- 6.2 Categories of Beverages.- 6.3 Types of Flavourings for Beverages.- 6.4 Methods of Extraction, Solubilisation and Concentration of Flavourings.- 6.4.1 Extraction of Coffee Flavour and Manufacture of the Instant Product.- 6.4.2 Flavourings Extracted from Harvested Fruits.- 6.4.3 Extraction Use of Oil Soluble Flavourings.- 6.5 Beverages Based on Ginger.- 6.5.1 Manufacture of Ginger Extract.- 6.5.2 ‘Original’ (hot) Ginger Ale.- 6.5.3 ‘American’ or ‘Pale’ Ginger Ale.- 6.6 Formulation of Beverages.- 6.6.1 General Principles.- 6.6.2 Principal Components Used in the Formulation of Beverages.- 6.6.3 Label Claims.- 6.6.4 Sweetness/Acid Ratio.- 6.6.5 Alcoholic Components.- 6.6.6 Water.- 6.6.7 Characterising Ingredients.- 6.6.8 Other Ingredients.- 6.6.9 Acidulants and Acidity Regulators.- 6.7 Summary.- 7 The flavouring of confectionary and bakery products.- 7.1 Introduction to Confectionery Flavourings.- 7.2 Basic Confectionery Types, Recipes, Inherent Flavours.- 7.2.1 High Boilings (Hard Candy).- 7.2.2 Fat Boilings.- 7.2.3 Toffees and Caramels.- 7.2.4 Fudge.- 7.2.5 Fondant.- 7.2.6 Candy.- 7.2.7 Cream and Lozenge Paste.- 7.2.8 Compressed Tablets.- 7.2.9 Jellies and Gums.- 7.2.10 Chewing Gum.- 7.2.11 Panned Work.- 7.2.12 Chocolate.- 7.3 Flavours from Ingredients.- 7.4 Flavours Developed During Processing.- 7.5 Selection of Flavourings.- 7.6 Ingredients of Bakery Products.- 7.6.1 Flour.- 7.6.2 Sugars.- 7.6.3 Fats.- 7.6.4 Liquids.- 7.6.5 Gases.- 7.6.6 Other (Minor) Ingredients.- 7.7 Bakery Products.- 7.7.1 Bread.- 7.7.2 Hot Plate Goods.- 7.7.3 Morning Goods.- 7.7.4 Powder Goods.- 7.7.5 Biscuits.- 7.7.6 Cakes.- 7.7.7 Baking Process.- 7.8 Bakery Fillings.- 7.8.1 Jams and Jellies.- 7.8.2 Marshmallow.- 7.8.3 Creams.- 7.8.4 Biscuit Creams.- 7.8.5 Icings.- 7.9 Summary of Flavouring Characteristics.- 8 Savoury flavours for snacks and crisps.- 8.1 Introduction.- 8.2 History of Savoury Flavours for Snacks and Crisps (Potato Chips).- 8.3 Snacks.- 8.3.1 Savoury Biscuits.- 8.3.2 Market Separation.- 8.3.3 Potato Crisps/Chips.- 8.3.4 Extruded Maize Snacks.- 8.3.5 Fried Snacks.- 8.3.6 Nuts.- 8.3.7 Tortilla Snacks.- 8.3.8 Snack Biscuits.- 8.4 Basic Recipes for Crisps and Snack Savoury Flavours.- 8.4.1 Salt and Vinegar Flavour.- 8.4.2 Cheese and Onion Flavour.- 8.4.3 Smoky Bacon Flavour.- 8.4.4 Beefy Barbecue Flavour.- 8.4.5 Cheese Flavour (for Corn Curls).- 8.4.6 Paprika Flavour.- 8.5 Ingredients for Savoury Flavours.- 8.5.1 Production Methods.- 8.5.2 Quality Systems and Methods.- 8.6 Major Raw Materials and Ingredients used in Powder Savoury Flavour Blends.- 8.6.1 Acids and Acidity Regulators.- 8.6.2 Anti-Caking Agents.- 8.6.3 Colours.- 8.6.4 Carriers and ‘Fillers’.- 8.6.5 Dairy Powders.- 8.6.6 Fat Powders.- 8.6.7 Flavour Enhancers.- 8.6.8 Flavourings.- 8.6.9 Herbs and Spices.- 8.6.10 Hydrolysed Vegetable Proteins.- 8.6.11 Salt.- 8.6.12 Sweeteners.- 8.6.13 Vegetable Powders.- 8.6.14 Vitamins.- 8.6.15 Yeast and Yeast Extracts.- 8.6.16 Pre-Extrusion Flavours.- 8.7 New Developments and Trends.- 8.8 Conclusion.- 9 Dairy flavourings.- 9.1 Introduction.- 9.1.1 History of Animal Milks as a Human Food Source.- 9.1.2 The Development of Flavour in Dairy Products.- 9.1.3 Instrumental Analysis.- 9.1.4 The Development and Uses of Dairy Flavourings.- 9.2 Milk and Cream.- 9.2.1 Whole Cows’ Milk.- 9.2.2 Whole Milk Powder.- 9.2.3 Skimmed Milk.- 9.2.4 Sterilised Milk.- 9.2.5 UHT Milk.- 9.2.6 Evaporated and Sweetened Condensed Milk.- 9.2.7 Cream.- 9.2.8 Sterilised Cream.- 9.2.9 Clotted Cream.- 9.2.10 Casein.- 9.2.11 Whey.- 9.2.12 The Applications of Milk and Cream Flavourings.- 9.2.13 The Development of Milk and Cream Flavourings.- 9.3 Yogurt and Fermented Products.- 9.3.1 Yogurt.- 9.3.2 Other Fermented Milk Products.- 9.4 Butter.- 9.4.1 Sweet Cream Butter.- 9.4.2 Cultured Cream Butter (Lactic Butter).- 9.4.3 Ghee.- 9.4.4 The Flavour of Butter.- 9.4.5 The Uses of Butter Flavourings.- 9.4.6 Margarine and Low-Fat Spreads.- 9.4.7 The Development of Butter Flavourings.- 9.5 Cheese.- 9.5.1 The Manufacture of Cheese.- 9.5.2 Classification of Cheese Types.- 9.5.3 The Development of Flavour in Cheese.- 9.5.4 Review of a Range of Key Cheese Types.- 9.5.5 Related Products.- 9.5.6 Applications of Cheese Flavourings.- 9.5.7 The Development of Cheese Flavourings.- 9.6 Manufacturing Considerations.- 9.7 Conclusion.- 10 Thermal process flavourings.- 10.1 Introduction.- 10.1.1 Description and Definition.- 10.1.2 History and Necessity.- 10.2 Research into Beef Flavour.- 10.2.1 Reactions of the Precursors.- 10.2.2 Evolved Volatile Compounds.- 10.3 Creating a Process Flavouring.- 10.3.1 Basic or Foundation Part of the Flavouring.- 10.3.2 The Aroma Volatiles.- 10.3.3 Enhancers, Fats, Herbs and Spices.- 10.3.4 Compounding the Complete Process Flavouring.- 10.4 Applications of Process Flavourings.- 10.4.1 Simple Mixing.- 10.4.2 Application to Outside (‘Dusting’).- 10.4.3 Addition During Product Manufacture.- 10.5 The Safety Question.- 10.5.1 Safety of Protein Hydrolysates.- 10.5.2 Safety of Thermal Process Flavourings.- 10.5.3 Microbiological Standards.- 10.6 Thermal Process Flavourings in the Future.- Appendices.- References and further reading.